Sporting a red tilak, Congress President Rahul Gandhi, while campaigning in Amethi, lambasted Prime Minister Narendra Modi for destroying the country's banking system after reports emerged that several cash dispensers in the country have run dry. 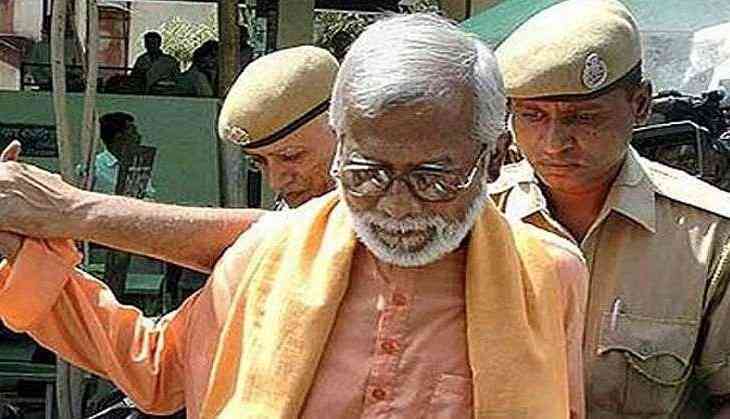 However, Gandhi, who in the recent past has lost no opportunity to attack the government, remained uncannily silent on the acquittal of Aseemanand and four others in the 2007 Mecca Masjid Blast that killed nine and injured dozens. Not even his party has said much on the judgement which witnessed a dramatic twist after the judge that acquitted the accused resigned soon after giving the verdict. When asked about the party's reaction on the verdict, party's national general secretary and in-charge of organisations and training, Ashok Gehlot called it a judicial matter and said he would not like to comment on it. While other Opposition parties have attacked the BJP government for diluting the case, Congress has so far maintained an eerie silence. Congress leaders might deny coining the term 'saffron terror', but there is ample evidence to suggest otherwise. It was probably first used by the then Home Minister P Chidambaram in 2010 when he cautioned the chiefs of state police forces, security and intelligence officials against saffron terrorism. “There is no let up in the attempts to radicalise young men and women in India. Besides, there is the recently uncovered phenomenon of saffron terrorism that has been implicated in many bomb blasts of the past. My advice to you is that we must remain ever vigilant and continue to build, at the Central and State levels, our capacity in counter-terrorism,” he was quoted by the The Hindu in 2010. Thereafter, in 2013, party leader Sushil Kumar Shinde had accused BJP and RSS of promoting “Hindu terrorism”. Back then several senior party leaders had backed Shinde who was eventually forced to issue a clarification. According to a cable by former US ambassador, which was released by Wikileaks in 2010, even Rahul had mentioned how radicalised Hindu groups were a bigger threat to India. So, why did Congress or Rahul not raise this issue when all the accused were acquitted by the court despite several reports of how the entire probe was scuttled? The resignation of the judge and appointment of a public prosecutor who has no experience in criminal trial – and was a member of Akhil Bharatiya Vidyarthi Parishad – being handed such a sensitive case does raise serious questions about the way the probe was conducted. And, yet the Congress remained silent. The only logical reason for this ignorance could be the upcoming polls in various states, particularly Karnataka. With elections in the southern state only a fortnight away, the Congress would not have wanted to be seen as an anti-Hindu entity considering how Rahul has been temple hopping in the state to get support of the majority community. In the past, Congress has often been accused by the BJP of minority appeasement while ignoring the sentiments of the majority community. Rahul had adopted a similar strategy in Gujarat where it, for the first time in the last many years, was able to give BJP a tough fight in their own bastion. Though Congress failed to form government, it succeeded in confining BJP's tally to not cross two digits. Elated with such a response, the party has deployed a similar strategy in Karnataka and is likely to adopt it other states where it goes to polls later this year. Perhaps for this reason that the party has held itself back from raising Aseemanand's acquittal to ensure it isn't seen as a party that represents the interests of only one community. In fact, after its disastrous performance in 2014, the party had formed AK Anthony committee to look into the reasons for its failures. In his report, Anthony had claimed that the party was increasingly seen as pro-minorities which had done little to protect the interests of the majority community. His observations found many takers in the party and eventually in 2017 during the Gujarat elections, the Grand Old Party decided to woo the Hindus with Rahul visiting temples across the state. “It would have been foolish to get drawn into this anti-Hindu debate being created by the BJP. We have an election to fight in Karnataka and taking the BJP's bait could cost us the elections. We have to be very careful. Moreover, everyone knows what Congress is all about,” said a senior party leader from Karnataka. This leader, however, agreed that its not secret that investigating agencies are being pressurised by the government to let the accused go scot-free. And yet, he would not want to go one record on this. “There is no official or unofficial diktat to not speak on these issues but Congress leaders know that they have to avoid it at all costs. We do not want to have a Mani Shanker Aiyer-like moment right before the polls,” he said.